I have recently contacted the Sacramento cold cases department regarding the 30 year old murder case of Koy Ien Saechao (48) and Choy Fow Salee (40), a Laotian couple brutality gunned down on the hard shoulder of a Sacramento highway on April 22nd 1986. This has been covered twice before, but I am attempting to find more information on this crime, including any police reports, as the information on the internet is scant to say the least. The crime was originally linked to Devon Stuart Olson, however Sergeant James Lewis in 2001 reiterated that none of Olson's statements matched to any of the crimes he claimed and he wasn't charged in these murders. Rewinding the clock back fifteen years, the Donna Lass case entered the Zodiac sphere with the mailing of the Pines Card on March 22nd 1971 inferring he may be the killer. Donna Lass disappeared from a South Lake Tahoe casino in the early hours of September 6th 1970 and has never been heard or seen of since. Gian Quaser of the Quester Files ran a story indicating a possible link between Donna Lass, Judith Hakari, Nancy Bennalack and Carol Hilburn, the latter three of which were all murdered in Sacramento in 1970. A straight line from the Vallejo and San Francisco region to South Lake Tahoe takes you directly through Sacramento. The slaying of Koy Ien Saechao and Choy Fow Salee, although sixteen years later, took place within 10 miles of the murdered women in Sacramento, and furthermore the Zodiac Killer would possibly claim these murders in a 1986 letter.. What is most important, is what the Zodiac meant in the 1986 letter by "The Blue Meannies almost caught me." Is he talking about his interaction with the Highway Patrol officer in the article. The murders of Koy Ien Saechao and Choy Fow Salee had all the hallmarks of Lake Herman Road and Blue Rock Springs Park, a couple fired upon while inside their vehicle, just like Darlene Ferrin and Michael Mageau. The Laotian couple were shot multiple times from close range. Both front side windows were blown out, with 15 shell casings strewn around the vehicle. This was a merciless assault on the side of the highway. Koy Ien Saechao and Choy Fow Salee were traveling back on the two and a half journey to their residence in Dorman Road, Yuba City after visiting their son in a Merced CA hospital, situated in the area of the San Joaquin Valley of Northern California. They were only 45 minutes from home when it was believed they had opted to take a rest on the roadside edge, near the interchange of Highway 99 and I-5 Sacramento and unfortunately for them, a merciless killer was in the vicinity. However without knowing the exact dynamics of the crime, it is equally plausible they were ushered to the side of the highway on a ruse, similar to the Modesto abduction of Kathleen Johns. The 1986 letter claimed to be from the Bay Area killer, but what catches the eye, is how close this letter is to the Koy Ien Saechao and Choy Fow Salee murders. ​ The letter was postmarked 6th May 1986. The letter writer stated his victims were collected "about two weeks ago." Exactly 14 days prior to May 6th was April 22nd, the day the couple were murdered. The letter writer stated "up by Sacramento." They were murdered close to the center of Sacramento. The letter writer stated "They were killed by a freeway" and "I want you to know about my latest slaves." Both statements indicative of more than one victim. The couple were also murdered right next to a two lane freeway. (Highway 99). The letter writer stated "The Blue Meannies almost caught me," indicating that he saw police that night, likely close to the scene. The mystery hitchhiker directed police to the scene, reminiscent of his two phone calls, but subsequently was never traced. Was this the Zodiac playing games with the police and hence his reference to "The Blue Meannies almost caught me." The hitchhiker flagged down a California Highway Patrol Officer in East Nicolaus and informed him of an automobile accident at the precise location the couple were eventually discovered. The Zodiac could again be claiming murders for which he had no hand in, so it is imperative to find more detailed information on this crime and possibly elaborate on his claim of a near miss with police. It would also be interesting to discover the weapon used in this crime and compare the shell casings to ones retrieved in the Zodiac case. Koy Ien Saechao & Choy Fow Salee & Make a Welsh Man say Awww-Nawww Wich, Dis Cannaw Bee! Translated Rich means: Not you Too FFS Lol. Richard I am aware that every single Homicide in the State of California that was and is 'Unsolved' between 1966 up to the turn of the 21st Century, somebody somewhere at some time, have uttered the suggestion of Zodiac being responsible. It seems compulsory to bring up the name Zodiac. Over A Ten year period (1966 - 1976) records indicate SFPD had an overall success rate of 56% in Solved Homicide cases. Not When Detective R. Grinnel's team is on it. . . In 24 Hrs Detective R. Grinnel will improve this statistic up to a solved case percentage of 100%. Nothing wrong with looking, as well as thinking, outside the box for other victims and crimes that may be the work of Zodiac Rich, but not for Me. At least not yet. There is more than enough confusion to try to unravel in this case, a menu of Facts vs Fictions to dine out on and consume only facts whille binning the tastless Fictions. I don't want to add to an already mish-mash of confusion. But, if you feel it may unearth something of value, or a link found that may turn out to be crucial then, and I say this sincerely Mate, go fot it and completely ignore Me. I've been the same with The Riverside Cherri-Jo 'Connection' too mate so it's not these two you list above specifically, I try as best I can to stay away from that much supported theory of 'Zodiac's Riverside Activities' and have My reasons for doing do. However, others are convinced Zodiac is connected to Bates Murder and have their reasons for doing so also. I'm always outside the box Alex, just trying to not necessarily connect to more crimes, more so validate or dismiss the letter as Zodiac's. I have long believed the Zodiac was either banged up for life for another murder or died in 1971 or 1974. The 1986 and 1987 letters could change that perception, even if he never committed the crime. Yours Truly, Grinface and Welshchappie Detective Agency & Sons. If the letter really is from Zodiac, it sure comes across as a sad attempt to relive his former glory. It reminds me of a movie sequel -- maybe a Part 8 or 9 -- from a franchise people once cared about and inspired some level of public frenzy. But that was at least a decade ago and the production rights have been sold to a different studio who are now using a third-rate director and rookie actors in a last ditch effort to ride the coattails of the original to make some easy cash and appeal to the core audience. But stuff like this would inevitably go straight to video and maybe you'd find it airing on some cable station 5 years later at 2 in the morning. It could well be Zodiac but if so he's now become a shell of his former self. We find him resorting to tired tropes and generally absent of the fury and capacity for inventiveness he was defined by 15 years earlier. As much as the idea of Texas Chain Saw Massacre 12 might appeal to us as a concept, the reality of this fiasco would be hackneyed as Zodiac circa 1986. The Zodiac letters certainly started getting shorter as time went by, the Exorcist, SLA, Badlands, Red Phantom and 1990 Christmas Card, were meek by comparison. However I am not particularly convinced by any letters or cards after March 13th 1971. This particular letter, the 1978 and 1987 letters, whether from Zodiac or not is a tired collection of his old phrases stitched together, but whoever authored this letter got the date, area and city location all correct, and since this was likely the only double murder in Sacramento on April 22nd by a freeway, I would be highly surprised if this letter is referring to anything else. It certainly isn't a lucky guess. I have to agree with you. The '74 letters could be from him, but there's little chance these notes from '78, '86, '87, etc. are. If you look at his canonical letters from '69, '70, '71, we can be close to certain these are coming from the same person who is also very likely the killer. But the handwriting in these early letters really bears no resemblence at all to the letters that came after '74. I don't think it takes an expert to declare the '86 letter is the product of someone trying put one over on us - and doing a poor job of it. Just look at the early writings and this one side by side, they are very different. I suppose when we see the see the familiar phrasings and vague similarities in certain strokes of the pen, a part of our brain tugs at us and asks "what if?" But that impulse needs to be arrested at its source. It doesn't take much for some lowly person with a modest ability at handwriting mimicry to read about the double murder in Sacramento and then decide to take a few minutes to scrawl this rubbish across a page of paper and throw it in the mail. We need to recognize it for what it is. Even though I have reservations about the later letters, I don't completely rule them out as genuine. Graphology is not an exact science, if a science at all and although they are very specialized in their field, they are still subjective conclusions. There is 17 years between the handwriting from 1969 to 1986 and if I compare my handwriting from 17 years ago, it is simply not the same. Everything changes when you get older, personality, concentration, dexterity etc, so handwriting be an extension of us, should be no different. Let us assume this 1986 letter was a hoax, not written by Zodiac, then we have to ask ourselves a question. Why would a hoaxer bother to rekindle a case that has dropped out of the public eye, rather than hoax a letter for a current, more topical murder. Even if the 1978 letter was genuine, its been 8 years and why select a case in Sacramento. There must have been cases in San Francisco or Vallejo that would seem much more credible hoaxes. If this were a genuine letter, it certainly has his MO written on it regarding the first two crimes, multiple shots into a vehicle, a couple targeted and only 70 miles from Vallejo. The couple were traveling back from Merced and it was assumed they pulled in for a rest. However they were only 45 minutes from home. Merced to Dorman Avenue where they lived is 2 hours 30 minutes journey time. My guess is any break you would take would likely be at the mid point, not with only 45 minutes journey time left and furthermore park in the dark on the edge of a highway, we all know how dangerous that can be. It is not unreasonable to assume they were flashed over by another motorist, as we have seen countless times before, then ambushed. Another odd thing is the hitchhiker who stopped the cop in east Nicolaus, directing him to the scene saying it was an accident, then never being heard from again. If the Zodiac had shot the couple, he would have had to have driven away, separated himself from his vehicle, then flagged down the cop for a bit of fun, so he could write about it later. "The Blue Meannies almost caught me." Of course the problem with the letter is it provides nothing unique, that he couldn't have obtained from the above article. Hoaxer or not, why did the person select this crime above all others after 8 or 12 years. it was a road rage case look in the twin cities for the killer. ask, why werent the children killed? the gunman was angry at the driver primarily. only front side windows shot out. I guess my initial question would be with regard to the public's level of access to his letters around the time of 1986. I think this hoax begins to make much more sense when we realize that Robert Graysmith's sensational first book "Zodiac" was published on Feb. 1, 1986. Certainly the case had been reintroduced into cultural consciousness and it's likely the transcripts of some of the real Zodiac letters were included in the book--which explains the cherry-pick style of stiched together cliches. As far as I know, this book was a huge hit. Many individuals were now learning about the case for the first time and becoming fascinated by it. I'd say there'd probably be more likelihood of something legitimate behind this had it occured a year or two prior--that is, before Graysmith's book was released. I think in reality there are probably lots of roadside murders that have very similar M.O. 's to what Zodiac was famous for. Some egghead was probably reading Graysmith's book and glanced at the newspaper story about the Laotian couple and decided to pull a prank. That is a really good point about Graysmith's book possibly being the trigger, either for a 'semi-retired' Zodiac or a copycat. There is only a 3 month gap between the release of the book and the murders, so this is a very likely possibility Greg. I'm surprised he didn't communicate separately and mention the book or Robert Graysmith, like he readily did with Dave Toschi. "Two days after the Saechao/Salee murders and not far away, Jimmy Lee Rowe was also parked up on the shoulder by the Exposition Boulevard exit and Highway 160, Sacramento, where he was found gunned down in his pick up truck. His killer has never been apprehended." In October 2016 they busted Diana Creech who was one of the two meth-headed culprits. I did notice it, but to be quite honest, couldn't be bothered to update it, as it was correct at the time of posting. It's a bit like the Lindsay Cutshall and Jason Allen Jenner murders on my Santa Barbara page. I believe somebody has been connected to this crime also. Thanks though Drew, I appreciate all the help people give me. Cheers Rich. That's completely reasonable Richard. I was just about to add Rowe to my brother's googlemap of possible Zodiac unsolved cases, and thought just this once I may have learned something you hadn't! Like with the Jenner case though it is great when any of these cold cases find resolution. I can probably only find what is available on the internet like you Mike, so you likely have already visited these sites. There doesn't appear a lot of information at all. Cannot find much on the decoder ring- hopefully somebody else can chip in. 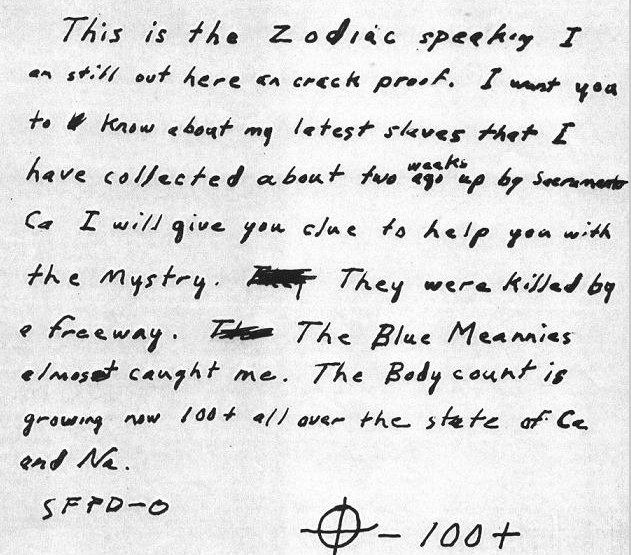 Zodiac case is solved by linking all the Blue Rock Springs shooting clues, since the letter sent and the calling to police dispatcher is undoubtedly associated to the real Zodiac killer. 1- Who was the man stalking Ferrin, was known to P.Huckaby too? His name was Richard? Was a man hiding his real identity or was familiar to them for a long period? If this man was A.Allen the case is closed (Allen used a false identity) otherwise we need to search to another Richard, the one of Dear Lodge prison for example, an auto-mechanic and that could explains also the Bates murder, because in the confession letter the killer manipulate the car of the victim before killing her. Bujok is not related to Bates murder in any ways. The only evidence for Darlene Ferrin being stalked originates from family members, not brought up directly after the murder. For me personally it's just hearsay and has no bearing in truth. I certainly don't believe Ferrin is the key to the case, and a stalker was responsible. At the time of BRS Michael Mageau never mentioned to police they were trailed to the BRS parking lot or mentioned any Richard. He brought all of this up years after the fact and along with his identification of Allen in Ontario Airport, 22 years after the crime is pretty desperate police work, from a man who only saw a profile of the killer for less than a second, with a flashlight in his face. His identification is effectively worthless. There are too many myths about BRS, that are effectively just muddying the waters. I think now, despite leaving the door open until recently, that Arthur Leigh Allen is not the Zodiac. Don Cheney was a fantasist with a grudge and Cheney's claim of Allen calling himself Zodiac and hunting couples, was offered to police after the fact, not before the initial murders or 'Debut of Zodiac' letter. Allen was ruled out by Donald Fouke, hair, DNA, fingerprints, palm prints, handwriting, it wasn't his MO and Cheney lied. There is actually nothing on Allen. The Deer Lodge connection is interesting, if in fact Zodiac ever said Deer Lodge Bryan Hartnell originally stated the killer said he came from Colorado and the interviewer may simply have been putting words in his mouth. Ed Edwards mentioned Bujok in his book, regarding the afterlife, but how trustworthy is Edwards, particularly when you need to sell as many books as possible. Your right about Bujok, in that if Zodiac killed Bates, Bujok is not Zodiac, simply because he was released on December 17th 1968. I have fully completed and solved the three (3) Ciphers left behind by the Zodiac. verify that I have solved all three (3) remaining Zodiac Cipher Codes. Hi Linda, I have contacted the FBI several times and received redacted FBI files. Unfortunately that email contact is now useless, and the FBI have made it much more difficult to contact them for FOIA and other subjects. All I can give you regarding the relevant FBI Departments is what is freely available on the internet. I would begin with Sacramento. Here are some links that you've probably already found. If that fails, leave a comment on Zodiac Killer Ciphers for Dave Oranchak, who has likely had more dealings in this matter than me. He may be able to help you further. Has anyone tried to rotate a cipher before a solving attempt? There could be 3 more views to examine, not just the traditional one. The Taxi cab murder had one interesting fact. The cabs total amount of fair was 2.17$ and then they talk about the address of Kane. They stated that he lived at 217 Eddy... could that have been a simple hint without being in a letter? Their calculations in the show were not particularly accurate. They said the meter read $2.17, whereas the meter read $6.25 at 10.46 pm according to the police report. In other words the meter was ticking over for 51 minutes at this point. The taxi charges they displayed states "Ten cents for each one and one fourth minutes (1.25) of waiting or traffic delay time. 51 minutes divided by 1.25 = 40.80. Multiply this by 10 cents =408 cents= 4 dollars 8 cents. Deducting this off $6.25 is how they arrived at $2.17 (the person in the taxicab would never have seen this figure). But what they didn't take into account is how many delays or waiting time occurred en route as well. The cab had traveled 0.2 miles for first 55 cents.= $1.62. Then its 10 cents each additional one fifth mile. $1.62 divided by 10 cents = 16.2 miles divided by 5 = 3.24 miles. This is the figure they arrived at for distance traveled. But they have to add back on the 0.2 miles for the first 55 cents. Therefore the distance is actually 3.44 miles. They have assumed the taxicab meter began at 55 cents, but the 55 cents only totals for the first one fifth mile (0.2), which they call the "flag". In other words it continues on from 55 cents after that first one fifth mile. The distance from Washington and Cherry to Union Square by the theater district is 3.1 miles, as it is for Eddy Street. But we have to factor in any extra idle time en route, along with the 51 minutes the taxicab remained at Washington and Cherry. But assuming this was negligible (say 10-20 cents maximum), has the taxicab traveling possibly 2 X one fifth mile less. Deduct this from 3.44 miles, has the taxicab traveling 3.04 miles. But if no delays en route 3.44 miles. The taxicab meter never read $2.17 at the crime scene.